Sudden Death Syndrome (SDS) is caused by the soilborne fungus Fusarium solani f. sp. glycines. This fungus overwinters in residue and in soil as chlamydospores which are very resistant survival spores (similar to oospores of Phytophthora spp.). Foliar symptoms are caused by toxin(s) produced by the fungus which are translocated to the foliage. 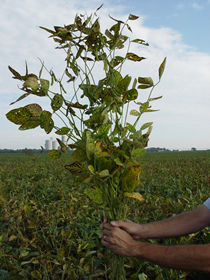 Foliar symptoms of sudden death syndrome typically do not appear prior to soybean flowering. Early symptoms at the R3 and later growth stages consist of the presence of chlorotic (yellow) spots on the leaves between veins. As the symptoms advance, the yellow spots may coalesce, but stay between the veins at the leaf margin. Eventually the yellow areas between the veins will become brown (necrotic) as the tissue dies. Roots will exhibit an obvious root rot typically on the tap root. The discoloration of the vascular tissue is contained to the outer stem area (xylem vessels) and can extend up the stem from the soil line. The pith will remain white. (This is a key symptom to differentiate SDS from brown stem rot.) Pods may be aborted and plants may defoliate early. Defoliated plants will retain their petioles (leaf stems). Retention of the petioles is a symptom frequently associated with SDS. Symptoms on the root system are difficult to distinguish from other soybean root rots. When roots are removed from soil, the fungus is often visible on the outer root surface as masses of cobalt blue growths. Sudden Death Syndrome is favored in high-yield environments. The disease is more prevalent during cool, wet growing seasons and is favored by early planting in cool soils. Hot, dry weather appears to slow disease development, but depending on the stage and infections which may have occurred prior to dry weather it can become severe under these conditions. Heavy rains around the flowering time promote foliar symptom development. Soybean varieties with moderate-to-high levels of resistance to SDS are available. Varieties with partial resistance or tolerance to SDS should be considered in fields known to be affected by this disease. Avoid early planting in fields know to be severely affected by SDS. Two year rotation out of soybean production and maintaining good crop nutrition has been shown to reduce the severity of SDS. Seed treatment fungicides traditionally have not been shown to help manage this disease, but in 2014 Bayer Crop Science released ILeVO® seed treatment which has activity against SDS. Many field trials have shown positive yield responses in fields with significant amounts of SDS. More research is being conducted on how much of the field needs to be affected to justify the added cost of treatment.